The use of biotechnology in one or more key process steps in chemical manufacturing is growing strongly and likely will account for a significant proportion of total chemicals output by 2025. Flowschemes typically comprise a series of linked process areas, each of which may include one or more unit operations (see Figure 1). The nature of these may vary from the relatively simple (e.g., medium preparation) to the more complex (e.g., fermentation, centrifugation and freeze drying). Figure 1. A bioprocessing flowscheme generally involves a number of unit operations that differ from those in conventional chemical manufacture. Chemical manufacture using enzymes and microorganisms can involve a very different set of operating requirements and conditions from those of traditional methods of synthesis. So in this article, we'll review some of the major differences and discuss how these impact pumps, valves and mixer seals. Where biomass is the raw material, preparation typically will involve crushing, chemical treatment to break down the cell structure, and conversion into a liquid or slurry to permit transfer to the bioreactor. The properties of the resulting liquid or slurry, the subsequent processing operations, and parameters (e.g., temperatures and pH) will determine the technology and materials to be used in the pumps, valves and seals. For example, with high-viscosity slurries, it may be more appropriate to use a progressing cavity pump, whereas a plastic-lined centrifugal pump may be preferable where solids' content is lower and pH is acidic. A particular issue for second-generation feedstocks such as corn stover and other cellulosic materials is the often-abrasive quality of the biomass. When harvested, stover can include significant quantities of sand (up to 6%), which may not be removed completely at the separation stage. This can result in significant wear on the pump casing and impeller. Therefore, many bio-based ethanol producers standardize on ASTM A995, grade CD4MCuN (DIN SEW 410) for pumps for performance and for inventory cost-reduction purposes. This duplex stainless steel is harder than austenitic varieties, offering improved wear resistance. It also has greater pitting and crevice corrosion resistance than austenitics and other duplex stainless steels. Suitable alternatives include: ASTM A995, grade CD4MCuN with hard coating; CR29 hard chrome cast iron (>500 Brinell); ASTM A744, grade CN7M (Alloy 20) (WN 1.4500); ASTM A744, grade CF8M (316 stainless steel) (DIN 17445); ASTM A395, grade 60-40-18 (DCI); and fluoropolymer. In traditional chemical synthesis, temperatures, pressures and pH can vary significantly. Reaction temperatures can range from below 0°C (32°F) to more than 200°C (390°F), while pressures can extend from below atmospheric to several hundred bar. By contrast, in biotechnology the conditions in the fermentation process tend to be within a much narrower range of temperature and pH, and with pressure at or near ambient. This is because enzyme activity is particularly sensitive to temperature and pH, and conditions outside of a limited range result in rapid enzyme degradation (denaturing). 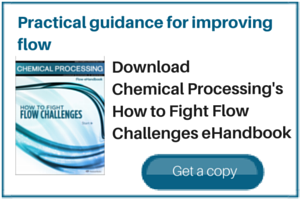 It is at the fermentation stage where the operating conditions and requirements — and demands on pumps, valves and seals — can differ significantly from those of traditional chemical synthesis. For successful fermentation, sterilization of the process plant equipment, in addition to that of the nutrient media, fermenter additions (such as anti-foaming agents) and air (for aerobic processes), is essential. At current levels of output of bio-based chemicals, batch sterilization dominates. For large-scale fermentation in up to 10,000-L (2,650-gal) bioreactors, continuous sterilization is employed wherever possible, although semi-continuous/batch-fed operation may be more appropriate where nutrient delivery/culture removal is difficult to balance. Table 1 summarizes some of conditions faced by pumps in various services in a bioethanol plant. Table 1. Ethanol production presents several difficult pumping environments. In conventional chemical production, pump casings tend to be cast and, depending upon the reactants and conditions, are made in a wide variety of materials, ranging from cast steel through stainless steel to materials such as zirconium and titanium. In terms of design, the emphasis is on efficiency rather than ease of cleaning. Pumps typically are attached to pipework via bolted flanges. However, for biotechnology applications, pump design focuses on cleanability. This limits material options, particularly in the fermentation stage where sanitary pump designs are almost exclusively austenitic stainless steel. Flow rates and heads tend to be smaller than those of their traditional chemistry counterparts; depending upon requirements, threaded, bolted or clamped connections to external pipework can be used. For pumps, ease of cleaning influences the design of the volute (wetted part of pump) as well as the internal surface finish. In batch fermentation, it's essential that all associated process plant equipment is thoroughly cleaned at the end of the batch. Clean-in-place/sterilize-in-place (CIP/SIP) designs are important to ensure the desired level of cleanliness, to maintain sterility of the atmosphere within the pumping system while minimizing downtime. Most pumps can be steamed-in-place if they are designed in accordance with appropriate standards (e.g., ASME BPE Design and Manufacturing standards, 3A sanitary standards, DIN EN 12462 Biotechnology, GMP regulations and FDA regulations). These guidelines cover areas such as appropriate surface finish, materials of construction and fabrication, not only for pumps but also for valves and for seals. Adequate steam flow is required to maintain saturated steam within the pump being sterilized — so to enhance steam flow, pumps should provide a means for removal of the condensate formed as the steam cools. For proper sterilization to occur, this condensate must be removed from the pump quickly, to prevent formation of cold spots that may encourage bacterial growth. Therefore, when the pump must be self-draining, a tangential bottom drain is provided. Surface finish in wetted areas of pumps intended for biotechnology applications is critical because of the requirement to preserve hygienic or sanitary conditions. Thus, all product contact surfaces must be free of cracks, crevices and occlusions that could harbor and promote bacterial growth. In addition, the surfaces should not have abrupt changes in morphology, which can entrap particles by molecular adhesion. For homogeneous pore-free surfaces, forged or cold-rolled stainless steel is preferred. By contrast, sand casting and even investment casting can't provide the quality of surface finish required. Where cast pumps are used in biotechnology applications (e.g., because of flow/head constraints of the forged/cold-rolled equivalents), the wetted surfaces usually are electropolished. This is an additional process that adds to the cost; because of the variability of quality and surface finish of sand castings, only the highest quality sand-cast volutes should have further treatment. Low ferrite content (less than 5%) also is important because an iron film (so-called "rouging") can develop over stainless steel when steam is used as the sterilizing agent. Diaphragm valves by the nature of their design don't trap media — an advantage for biotechnology applications because it minimizes contamination or cross-contamination and facilitates system cleanup. Moreover, by using compliant materials such as polytetrafluoroethylene with an ethylene propylene rubber backing for the diaphragm, this type of valve can withstand sanitizing and sterilizing procedures. However, for operations such as fermentation, full-bore ball or butterfly valves are favored because they eliminate the risk of catastrophic seat failure and have superior flow characteristics. As with pumps, the preferred option is forged (rather than cast) material with tightly controlled chemistry and electropolishing where appropriate (e.g., in fine chemicals manufacture) to minimize contaminant buildup. Passivation (i.e., formation of iron and chromium oxides on metal surfaces) can further improve chemical resistance to biofilm buildup in vulnerable areas. Joints between valve bodies and the connecting pipework are a potential "dead zone" where stagnant water can pool and provide a breeding ground for microorganisms. Therefore, it's important that the inside diameter of the valve exactly matches that of the pipework. Valve seats should be made from fluoropolymer derivatives to allow bubble-tight shutoff, even under high cycle conditions. Agitation ensures the adequate mixing of nutrient and inoculum. The agitator usually consists of paddles mounted on a shaft that passes through the wall of the fermentation vessel and is attached to an electric motor. Choosing the correct seal for the mixer shaft is crucial because it must provide a barrier to ensure sterility is maintained following steam cleaning. Biofuels producers and other bioprocessors increasingly are specifying pharmaceutical-grade seals. These typically are dual cartridge seals that don't require threading or porting; this configuration minimizes opportunities for bacteria to settle out and multiply. As with pumps and valves, electropolishing and passivation of the wetted surfaces of the seal can reduce bacterial growth and potential carryover of contaminants. Fine chemicals derived by biotechnology often have high purity requirements. In such cases, it's important to avoid any seal-wear residue (arising from a soft carbon face running against a harder face) that may contaminate the fermentation process. Specifying sanitary seals or using non-contacting full-fluid film, gas or liquid seals can prevent such contamination. With this type of arrangement, to ensure compatibility with the product, special consideration must be given to the type of barrier gas or liquid used. The increasing use of biotechnology by chemical companies poses equipment challenges that will require concerted development effort, particularly by pump manufacturers. Current sanitary/hygienic designs must be scaled up to meet the higher flow rates demanded of commercial-scale operations. On the other hand, pump and valve producers that use traditional casting methods must address problems of how to maintain sterility while keeping prices competitive or perhaps must perfect alternative methods of manufacture. The stakes are high, and failure to tackle these issues could result in lost opportunity and significant reduction in market share. The challenge is to be able to adapt the solutions developed for low-quantity batch-type operations, as in the pharmaceutical sector, to the high-volume continuous-operation requirements of the bulk chemical industry. BILL NEWTON is Newark, U.K.-based strategic marketing manager (chemical industry) for Flowserve, a global manufacturer of pumps, valves and seals. E-mail him at bnewton@flowserve.com.